Phase transformations are a fundamental aspect of high pressure research, but the atomic level details of such transformations are difficult to observe experimentally. How is it that one solid phase transforms to another under increasing pressure? From the point of view of thermodynamics, the free energy of one phase becomes lower than the other with pressure. The mechanism of a transformation between two solid phases, however, contains even more subtle information about how interactions between atoms of a solid evolve with increasing density. 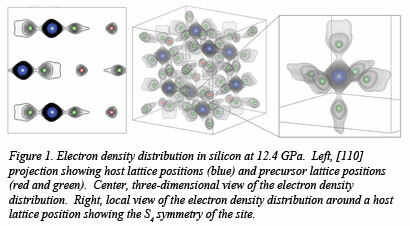 In work reported recently in Physical Review Letters, a research group from HPCAT, University of Nevada-Las Vegas and Jilin University made careful measurements of the electron density distribution in a single crystal of silicon up to 13 GPa, the pressure of the well-known α-β transition. As shown in Fig. 1, the electron density distribution at 12.4 GPa contains not only remnants of the low pressure structure (host lattice), but also reveals the appearance of two other groups of atoms corresponding to the atomic positions of the high pressure phase (precursor lattice). All three sets of positions are statistically occupied on the time scale of he diffraction experiment prior to the α-β transition. First-principles calculations show that the two lattices can coexist dynamically through rapid lattice fluctuations. This interpretation provides a more detailed scheme for the phase transformation in this fundamentally important system than is possible with explanations given in the more familiar terms of displacive or reconstructive processes, and lays the groundwork for similar studies of more complex materials [G. Shen et al., Phys. Rev. Lett 109, 205503 (2012)].